While Amazon crafts its business plan for healthcare, a handful of entrepreneurs are parlaying parts of Amazon's model into an online marketplace for dental supplies. Dentist Scott Drucker's inspiration hit after he found that he could buy cheaper dental supplies online than what distributors offered, so he decided to create his own e-commerce platform to allow others to do the same. After graduating from dental school at the University of Pennsylvania and starting his periodontics residency at the University of Illinois, Drucker had spoken to two of the biggest dental supply companies, which offered him a "generous discount" as a new dentist. But after checking other sources online, Drucker found every one of his products for a substantially lower price, he said. "It was a timeout moment," Drucker said. "We are led to believe that the biggest companies theoretically provide the best discounts, but that was not at all the case." Big suppliers' business models are built on sales representatives that offer high-touch, personalized service but also add cost, Drucker said. Smaller practices that don't have the scale to negotiate a better deal often lose out. Drucker created Supply Clinic, where customers can peruse implants, orthodontics, cements and other products from more than 100 manufacturers, which ship items directly to their office. Supply Clinic, which was born about four years ago and developed in the Chicago-based healthcare incubator Matter, is suited for smaller one- or two-office practices that can save them 30% to 35% on each product, Drucker said. 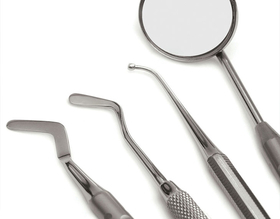 "Dentists are waking up to the fact that they are heading a pretty tremendous margin on supplies," he said. It's only a matter of time until most supply chain transactions are done through e-commerce platforms, said Paul Ketchel, founder of MDsave, a online marketplace that offers medical services a la carte. "I think we are in process where legacy models with multiple intermediaries in a transaction, similar to banking or the travel industries, are changing," he said. "These companies will have to adapt." As healthcare spending balloons and consumes a growing portion of the country's GDP, providers and payers look to aggressively cut costs. Industry middlemen that can inflate the pricing of healthcare products and services are particularly vulnerable, as consultancy PricewaterhouseCoopers highlighted in its recent year-end report. Intermediaries will have to reassert their value by increasing price transparency to avoid extinction, the report said. "Middlemen don't currently play one of the major roles in the industry as a financier, diagnoser or deliverer of care, that's why they are getting squeezed," said Gurpreet Singh, a partner at the consulting firm PricewaterhouseCoopers and its health services sector leader. More transactions will shift to e-commerce sites as medical professionals dismiss the sales rep model, Drucker said. "I don't think people are going to be willing to pay premiums for the same supply they can process themselves on an e-commerce site," he said. Amazon recently announced that it was teaming up with JPMorgan Chase and Berkshire Hathaway to create a healthcare company that's aiming for a lower-cost model. The e-commerce giant has also been quietly growing its medical supply business through its Amazon Business Platform, which has more than 1 million customers and 85,000 sellers. But as Amazon and other retailers continue to expand their medical supply catalogs, patient safety concerns arise as products are diverted to the "gray market," Drucker said. Some U.S.-based suppliers buy products that were originally intended for a foreign market and skirt U.S. laws and regulations. The increasing frequency of drug shortages has drawn focus on gray-market vendors and their often inflated prices as well as concerns about the quality and safety of their products. Of 549 hospitals that responded to an Institute for Safe Medicine Practices survey in 2011, 56% reported receiving daily solicitations from gray-market vendors and 52% reported purchasing drugs from gray market vendors in the last two years. As more distribution models shift to an e-commerce platform, these issues will become even more important, experts said. "If there is dental cement or composite that wasn't shipped at a proper temperature, that could break down quickly and impact someone's health and become a financial burden," Drucker said. "That's why we take quality control very seriously."